Family fun for everyone at Blue Slide Park.Ã‚Â This Saturday is the annual Story Walk.Ã‚Â Beginning with Books is an organization that exists to get more kids reading at a young age.Ã‚Â Each year Beginning with Books host a Story Walk in the park and brings books to life.Ã‚Â There are life sized story book settings in the park. 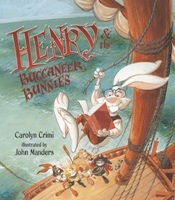 This year’s Story Walk is Pirate themed and the featured book is Henry and the Buccaneer Bunnies which was illustrated by Pittsburgher John Manders.Ã‚Â There will even be a giant pirate ship set up in Blue Slide Park. As any Pittsburgh child will tell you, Blue Slide Park is the BEST playground in town located at the entrance to Frick park on Beechwood Blvd.Ã‚Â See a map of the park here.Ã‚Â Here (and here) are some nice posts about others who love Blue Slide Park.